Started in 2010, Euro Palace Casino has maintained high levels of professionalism as well as a diverse selection of slots and games. The Casino is owned by Digimedia Limited Casinos and is licensed in the jurisdiction of Malta. 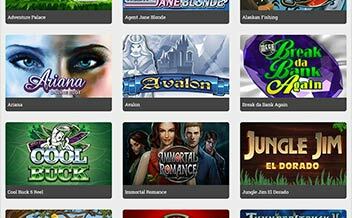 The Casino features an astounding assortment of slots and games from one of the best software developers, Microgaming. The Casino also boasts of amazing bonuses and promotions, robust client protection measures, as well as high-end live dealer games. Euro Casino has a number of bonuses and promotions that both new players and existing ones can enjoy. The welcome bonus features a bonus of up to $500. The first deposit attracts 100% match up to $150 while the second one attracts a 50% match up to $350. To withdraw the bonus and winnings, the player must wager the amount at least 40 times. Being a Fortune Lounge affiliated Casino, there are numerous other promotions for existing players, mostly the points system where players accumulate points the more they play games. 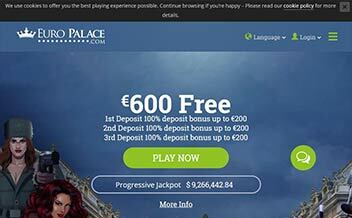 Euro Palace has one of the most incredible slot games available for punters to enjoy. 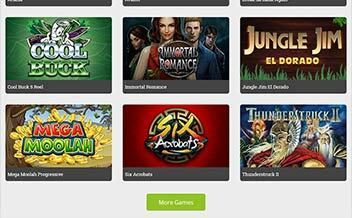 The games that are offered by their sole developer Microgaming guarantee players winnings regardless of their pocket size. Some of the games include Beautiful Bones, Jurassic Park, Thunderstruck, Six Acrobats, among others. Euro Palace also has the needs of the table game fans well catered. The Casino has a list of table games that are tailored to meet the ever-changing needs of the market. Some of the games available include Blackjack variants, Roulette variants, Baccarat variants, among others. Video Poker games are also in plenty in Euro Palace Casino. The Casino has a wide range of games in this section of Casino for players all over the world. Some of the games include Louisiana Double Poker, Jacks or Better, Deuces Wild, among others. Euro Palace has a Live Dealer that features croupiers that host live games. Players can enjoy taking part in some of the most incredible game offerings in real time and from the comfort of their home. Some of the games available are Live Blackjack, Live Baccarat, Live Roulette, among others. The Casino software is powered by one of the world’s best online Casino’s software developer Microgaming. This powerhouse is well-known for the vast selection of thrilling games that it develops. 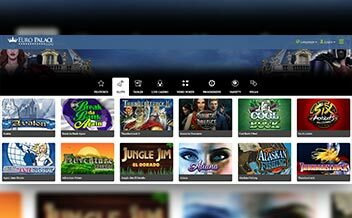 The Casino has an entirely instant play user-friendly interface that combines functionality and excellence. The United Kingdom, the United States, Italy, South Africa, France, Australia, Belgium, Iran, Denmark, Turkey, Israel, Spain, among others. Maestro, Master Card, Visa, Neteller, Paysafe Card, Visa Electron, Entropay, Direct Bank Transfer, PayPal, InstaDebit, Instant Banking, Baloto, eChecks, Solo, Moneta, Skill, Trustly, among others. US dollars Euros, Canadian dollars, Australian dollars, New Zealand dollars, Czech Republic Korunas, Polish zlotys, Argentine pesos, Nigerian nairas, Russian rubles, among others. Euro Palace Casino is available for players on download, instant play, and mobile devices. This makes it one of the most convenient online Casinos as players can enjoy their preferred games on the comfort of their home or while on the move. Mobile gaming can be accessed using either Android or IOS devices. Euro Palace Casino features a functional and sleek software that allows players to play their favorite games from home or while on the move using the mobile version. The Casino also has an incredible welcome bonus and solid customer support.